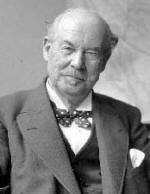 On the 8th January 1930, the tea tycoon Sir Thomas Lipton gifted some £10,000 to the city of Glasgow. This was his native city and in memory of his own mother, the money went towards the relief of poor mothers and their children. Born in a tenement in Gorbals in 1850, of Irish parents, Tommy Lipton left school at ten and at 15 was in America. He had stowed away in a ship. Initially he worked as a farm labourer in Virginia and South Carolina, later working in a grocer's shop in New York. He must have absorbed American business flair, for five years later he was back in Glasgow opening what was to be the first shop in an extremely successful retail empire. In ten years he was a millionaire, acquiring tea estates in Sri Lanka and meat processing factories in America. His business philosophy he summed up as, "Work hard, deal honestly, be enterprising, exercise careful judgement, advertise freely but judiciously." In the tea business, particularly, he was innovative, selling different tea blends to different countries and using containers to help preserve freshness. It was Lipton who was the first to package tea in small, convenient tins to keep it fresh, preserve the flavour and guarantee that customers received the correct amount of tea. By the turn of the century, tea was a popular beverage on both sides of the Atlantic. In 1904, two interesting developments happened almost simultaneously that would broaden tea's appeal even more. In New York, a tea and coffee merchant named Thomas Sullivan decided to package loose tea in small, hand-sewn silk bags as an inexpensive and convenient way to distribute tea samples to his customers. To his surprise, his customers brewed the tea in the tea bags rather than removing the contents and so was born the now ubiquitous tea bag. The Thomas J. Lipton company further improved upon this invention with the introduction of the Flo-Thru Tea Bag in 1952. With four brewing sides, rather than two, boiling water reached the tea more easily, releasing more of the Lipton "BRISK" tea taste. Lipton's relaxation was sailing and he used his fortune to enter a succession of boats (all named 'Shamrock') in the Americas Cup. In all he raced five times but never won. He was such a good loser however, that America presented him with a gold cup anyway! Lipton never forgot his native city and on his death he bequeathed to Glasgow his extensive personal collection of newspaper cuttings, photographs and memorabilia, now housed in the Mitchell Library. There are over 100 large volumes of press cuttings from 1877 until his death. They cover all aspects of his business and social life but particularly concentrate on his five unsuccessful challenges for the America's Cup. There are over 2,000 photographs in 48 volumes, which were preserved in part due to financial aid from Unilever, who now own the Lipton brand. On his death in London, in 1931, Sir Tommy Lipton left no family, bequeathing his estate to Glasgow. His portrait on his brands of tea had become part of the social fabric of the times. Queen Victoria knighted Lipton, both for his commercial success as well as his philanthropy. During the Spanish-American war and later during WWI, Lipton gave money and services to aid the wounded.